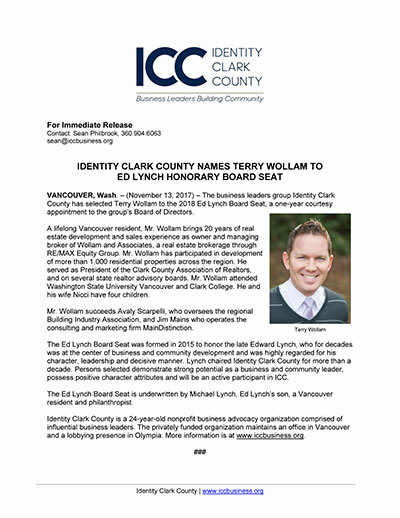 The business leaders group Identity Clark County has selected Terry Wollam to the 2018 Ed Lynch Board Seat, a one-year courtesy appointment to the group’s Board of Directors. A lifelong Vancouver resident, Mr. Wollam brings 20 years of real estate development and sales experience as owner and managing broker of Wollam and Associates, a real estate brokerage through RE/MAX Equity Group. Mr. Wollam has participated in development of more than 1 ,000 residential properties across the region. He served as President of the Clark County Association of Realtors, and on several state realtor advisory boards. Mr. Wollam attended Washington State University Vancouver and Clark College. He and his wife Nicci have four children. Mr. Wollam succeeds Avaly Scarpelli, who oversees the regional Building Industry Association, and Jim Mains who operates the consulting and marketing firm MainDistinction. Identity Clark County is a 24-year-old nonprofit business advocacy organization comprised of influential business leaders. The privately funded organization maintains an office in Vancouver and a lobbying presence in Olympia. More information is at www.iccbusiness.org.